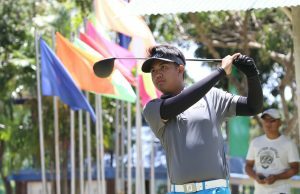 Cebu City – Apo Golf and Country Club settled for fifth place in the Founders Class with a total of 429 points (101-117-95-116) which wrapped up their campaign in the 72nd Philippine Airlines Interclub men’s regular championships at the Cebu and Country Club. Apo Golf and Country Club. 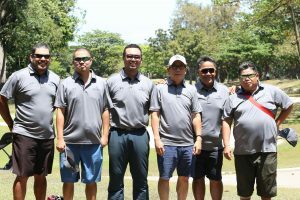 Team Apo Golf and Country Club wound-up fifth place in the Founders Class in the 72nd PAL Interclub Men’s Regular competition. In photo are Juan Karloz Alba, Chickoy Saavedra, Kuresh Samanodi, team manager Joseph Ng, Den-den de Castro and Jun Grandeza. (photo by Tommy Inigo). Apo’s 116-point on final day had Kuresh Samanodi leading the way with 36 points backed by Juan Karloz Alba (34) and the pair of Jun Grandeza and Chickoy Saavedra who finished with similar 23 points. Den-den de Castro’s 20 did not count. The title-run in this year’s campaign included Jing Gavino, Leo Fusilero, Miguel Fusilero, Vincent Gumapac and Rene Diago with Joseph Ng as team manager. Host Cebu Country Club (124-121-131-140-516) bagged this year’s title followed by The Orchard Golf (121-110-122-129-482), Forest Hills (110-113-117-118-458) and Valley Golf (108-117-111-103-439). 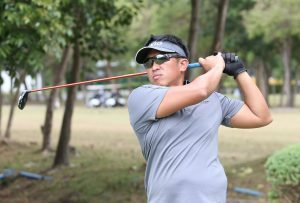 Vincent Gumapac tees off at the Cebu Country Club grounds for team Apo.